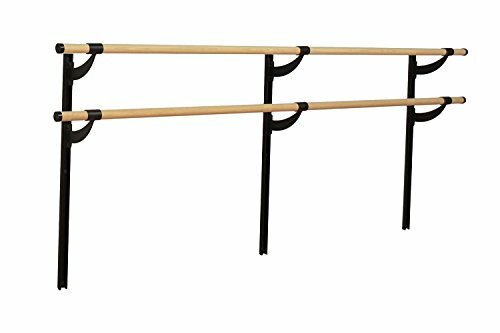 9 Foot wide traditional wood adjustable height double bar wall mounted aluminum ballet barre is sanded smooth, finish ready (most studios prefer to allow the wood to naturally patina over time). End caps are black. Barre is 1 1/2" diameter, the optimum size for users of all ages. Each of the 9ft barres ship as two 4.5' barres joined together by the center bracket. The system includes 6 wall brackets (3 for each barre) which are fabricated from 1/4" thick steel and powdercoated in a texture black finish, and 3 adjustable height tracks with all mounting hardware. Easy do it yourself installation. Please visit our storefront for other available sizes and configurations.